Long before the publication of Midnight’s Children brought alive new possibilities for Indian writers wanting to express themselves in English, decades before Arundhati Roy’s Booker win, the advent of the big publishing houses, hefty advances, the elevation of the fashionable young writer to pop-celebrity status, and the occurrence, once highly improbable, of the words “author” and “glamorous” in the same sentence, there was Anita Desai – Anita Desai, contributing short stories to a literary magazine while still in college in the 1950s; writing diligently at her desk for a few hours each day; sending her manuscripts to England because Indian publishers at the time weren’t interested in contemporary fiction; juggling the unsocial writer’s life with some very social demands, such as those of raising four children. 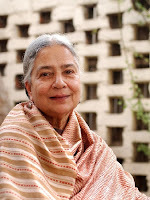 Desai is only the third Indian writer in English to be honoured thus by the Sahitya Akademi – Mulk Raj Anand and R K Narayan were the others – and yet the very phrase "Indian writer in English", with its hint of the baggage that the acronym IWE often carries, sits uneasily on a lady who once said that her novels "aren't intended as a reflection of Indian society, politics or character – they are private attempts to seize on the raw material of life". Her work bears this out. Though her concerns include the suppression and marginalisation of women, her approach is not a stridently feminist one (or especially directed at the treatment of women in conservative societies); if anything, it’s too underplayed for the tastes of some readers. It’s also part of a larger motif that can be seen in the three reissued books, that of the circumscribed life: people unable, or unwilling, to escape what many of us would think of as a trapped, claustrophobic existence, and who yet manage to find a measure of dignity even within those constraints. Clear Light of Day, which she has called the most autobiographical of her works, sets the lonely childhoods of two sisters, Bimla (Bim) and Tara, against their lives as adults – Tara having married a diplomat and moved to the US, thus escaping the family house where she had felt stifled, while Bim stayed behind, a custodian of old memories. In Custody has small-town lecturer Deven resigned to a humdrum existence until he gets the opportunity to interview one of his idols, a once-great Urdu poet now leading a shabby, parasitic life in an old Delhi house. And Baumgartner’s Bombay is about a perpetual outsider, a German Jew who escapes the Holocaust as a child and lives an unobtrusive, unremarkable life in India for decades. Desai’s attention to detail, the carefulness of her descriptions and the fact that her fiction often deals with static lives means that her books have sometimes been accused of being static themselves (“pages go by and nothing happens” is a charge I’ve heard) by readers who are interested more in the progression of a plot than in the examination of minutiae. But this would be to overlook the mastery with which she draws us into an interior world, showing us the layers that can exist beneath a life that might not, on the surface, appear to be very significant. In her hands, characters like Bim, Deven and Baumgartner come to stand for a small, modest form of heroism that doesn’t get the press it deserves (see Q&A below). In a perceptive introduction to the new edition of Baumgartner’s Bombay, Suketu Mehta calls it “a tribute to the also-rans of history”. The book is my favourite among Desai’s works and I love the final chapter, after Baumgartner’s death, which shows us his squalid little room as seen through other people’s eyes. To them, he was a useless old man whose life and death had no relevance to anyone, but to the reader – who has been closely involved with him through the book – he is a very important literary character. We’ve been privy to Hugo Baumgartner’s back-story, his crushed dreams, his quiet acceptance of his destiny, his love for his crippled stray cats (which, in the hands of a lesser writer, might have become a too-obvious symbol); we know about the cruel whimsicalities of history but for which he might have led a very different life in a different part of the world. We can’t dismiss him the way these people do. She came slithering down the satiny bark, growling and grumbling with petulance and complaint at her undignified descent. Then she was in Bim’s arms...cuddled and cushioned and petted with such an extravagance of affection that Tara could not help raising her eyebrows in embarrassment and wonder. Later on the same page, we have a corpulent, middle-aged character named Bakul sitting “flaccidly, flabbily” on a chair. A critic making a case for lucidity might argue that just one of those words could serve the purpose, but in Desai’s best work adjectives and adverbs (carefully chosen ones, of course) accumulate to make a picture even more immediate. At their best, her descriptions serve as a good counterpoint to George Orwell’s celebrated rules for writers; they show us that good writing doesn’t necessarily have to be spare and direct. Also, they sometimes convey the perspective of a particular character – a thoughtful character who is not a writer by profession and who doesn’t have to feel conscious about using too many words. Seen out of context, “...growling and grumbling with petulance and complaint at her undignified descent” may seem like over-writing, but consider how this word arrangement reflects Bim’s perspective of her beloved pet, apart from adding humour and affection to the scene. I met Desai for an interview at a small hotel in one of Delhi’s quieter colonies, Sunder Nagar. Despite her reputation for being reclusive, I was unprepared for how soft-spoken she is – and a little concerned that my tape recorder wouldn’t pick everything up. You wrote once that your novels “aren’t intended as a reflection of Indian society, politics or character”. Are you resistant to the defining of writers primarily in terms of their background? I think every writer dislikes being labeled, because once you’ve been put in a category you might even start to believe that that’s where you belong, and that can restrict your movements. It’s nice to know that you’re free to think and write as you wish. Whether you live here or abroad is of no consequence really – what is important is what you make of your experiences, which is what you present to the reader. Besides, once you’re boxed into a category, you run the danger of becoming a spokesman for that particular box. But my writing just isn’t polemical in that sense, it’s an absolutely personal response to life. The three books that have been reissued…were they your own choices? You once described Clear Light of Day as the most autobiographical of your novels. No, this was a Random House selection – the next lot of three books will be chosen soon as well, we have to decide on those. Clear Light of Day was autobiographical primarily in terms of setting and period – it was set in old Delhi, where I grew up, and around the same time. The other element was the relationship between Bim and Tara and their siblings – that’s something I wanted to explore, based on my experiences while growing up. Not that this is exactly my own family, of course. Bim is a fascinating character. As a child she announces that she wants to be a heroine, and though she remains confined to a small world, one can’t help but admire her personal choices. Yes, Bimla was based on women I had known, in India – women who had lived their lives against all odds, made something of their lives. I wanted to celebrate that sort of life, which is heroic in my mind. Being an individual despite all the pressure – to bear it, to suffer it, and yet remain yourself – and without necessarily stepping out of the house or seeing the world, as a heroic figure would normally be expected to: this is a form of heroism too, and it doesn’t get the attention it deserves. The same could be said for Baumgartner too. Yes, and in his case he suffers through great political upheavals as well – both in Germany, just before the war, and later in India. That book contains my view of politics as this huge juggernaut that rides over ordinary citizens – either you’re crushed by it or somehow you manage to survive it. Very few of us have any say in it, it always feels like the power is in someone else’s hands. But Baumgartner manages to survive (a note of tenderness enters her voice) like some little matchstick bobbing along on a vast ocean. And finally, he drowns. Which book is closest to your heart? That’s a very difficult question to answer. The truth is, one finishes every book with the feeling that you’ve missed it somehow – that you haven’t done what you set out to do, that along the way it took a turn you hadn’t intended. But when I wrote Fire on the Mountain (1977), I had the feeling that I was controlling a style that was largely my own. Until then I had been writing in imitation of writers I admired, who had a huge influence on me. Similarly, with In Custody, I felt I had broken out of that domestic circle I had been treading over and over again till I myself was feeling suffocated. And I felt that at last I was writing about the world that exists outside. These were moments of breakthrough. Also, the fact that the two central characters in In Custody were men. I wanted to write in the male voice – in fact, I had written the first draft without a single female character, but then thought that was unnatural! So I brought in Deven’s wife, and Nur’s women. Who are strong characters in their own right. Yes, but they are very peripheral, very marginal – at least in terms of how the men look at them. I enjoyed the bittersweet humour in that book – Deven’s earnest but woefully unsuccessful attempts to capture Nur’s voice on his tape recorder; how he invariably ends up with something embarrassing, instead f something he’d want to preserve for posterity. Yes, and though it’s all so frustrating for Deven, it’s possible for the reader to laugh at the situation too. I meant that bittersweet humour to be there – I certainly didn’t want the book to be an outright tragedy. It was meant to be the way life is, which is tragic-comic, with elements of the absurd. I believe you started writing very early in life. What was the Indian literary scene like in the 1950s and 1960s? How easy was it to get published? I started writing short stories when I was a child. When I was in college (in Delhi’s Miranda House) I contributed stories to magazines like “Thought” – a political and literary magazine of the time, which no longer exists – and later I started work on my first novel. I had certainly accepted the vocation of a writer before I married, and I continued it afterwards. It was completely different back then – one felt entirely on one’s own. There was no literary community. We were all so separated by different languages and lives that it was a rare occasion when one might even brush against another writer. It was a very solitary occupation, unlike today when there is a community constantly in touch with each other. The other thing is, there was no publishing outlet – Indian publishers of the time would do the safe thing, that is, publish textbooks or reprints. They never looked around or paid much attention to local, contemporary writers. I had no option but to send my manuscripts to England and I was lucky to find Peter Owen, a small publishing company with an interest in foreign writers and voices. The literary scene changed absolutely with Midnight’s Children in 1981. 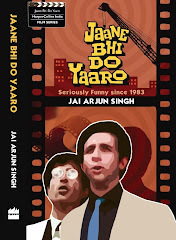 Publishers realised that one could write in an Indian version of English and do it with great vitality. Rushdie’s success and voice encouraged a whole generation of younger writers, set them free. Then, from the late 1980s, with more publishers coming in, writers had an outlet. The huge commercial success of Arundhati Roy was another inspiring moment – that you could make this much money, that thought was dazzling, it was almost like getting a contract from Bollywood. You could actually have a life of fame and celebrity by writing a book! You have a reputation for being very much the solitary writer, the sort of person Orhan Pamuk described in his Nobel speech - alone for hours at a desk. Yet you married early and brought up four children [including Kiran Desai, winner of last year's Man Booker Prize] in a society that has many expectations of women. How did you manage any privacy at all, let along find time to write your brand of intensely detailed literary fiction? There were two ways I could do that. One was by keeping to a very strict discipline, knowing that I must write daily and must keep my writing in mind constantly – that I had to spend a few hours each morning at my desk, writing. Even today, a day when I don’t do that is a disturbed day, not quite a normal day for me. When the children went to school I would immediately settle down at my desk; when it was time for them to come home I would put everything away, but keep it in mind so that I could pick up where I’d left off. The other thing that helped me as a writer perhaps was my personal reaction to the partly domestic, partly social life an Indian woman must lead – never feeling quite at ease with that sort of social life. I would, of course, go out and meet people, but there was a part of my mind which I was keeping separate. Because as a writer you have to have a private life – that’s where writing comes from. A young Indian writer today has many authors to derive inspiration from. When you began writing, there wouldn’t have been as many. Who were your influences? Mainly non-Indian writers, as you might have guessed. I read all the English classics – the Bronte sisters, Virginia Woolf, E M Forster. We didn’t really study the Indian writers – even Tagore wasn’t studied – we had to discover them on our own, later in life. As for contemporaries, I had a sense that I had no contemporaries! R K Narayan and Mulk Raj Anand were there, but from an earlier generation and I didn’t know them. 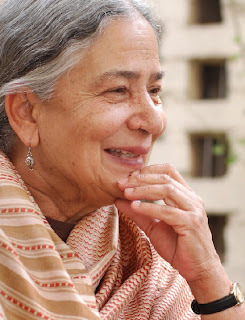 The one contemporary I had, whose company I enjoyed and who was a tremendous influence on me, was Ruth Jhabvala – she was a neighbour of ours in old Delhi, living a life very similar to my own. She was married, with three daughters – in fact, I first saw her when she was wheeling a pram up and down the road! We became friends, I would go to her house, she lent me books, we discussed books and that was the closest I came to a literary life. She was a huge support – she never read anything I’d written, she didn’t read manuscripts, but it was very encouraging to know that here was someone else doing the same thing; that it was possible to be a writer! When I spoke to Kiran last year, she mentioned that you aren’t part of the literary party scene at all. What are your feelings about the glamour that has crept into the literary life today? Yes, I’ve now moved to a house on the outskirts of New York – it’s small village really, very secluded. Whenever Kiran needs to do some serious work, she comes out there. My life is totally different from hers, though even she is quite solitary compared to most of her contemporaries. Things have changed enormously. Back when I started, we never had a clue that such a thing could happen at all – the glamour, the talk of big advances, etc, all of which sounds completely antithetical to the literary life. Of course, I don’t want to dismiss it altogether, because for the first time now Indian writers are able to live on their writing. It wasn’t possible at all earlier – royalties were absurdly low – but now publishers are willing to invest in authors, making it possible for them to live even while they are writing. So that’s not a bad thing. What’s unfortunate is when they win respect by suddenly having money and access to a better life, rather than by their actual writing. No, I don’t keep in touch with online developments. I’ve been watching Kiran and though she probably doesn’t use the Internet as much as most other young people, it still eats up a huge amount of her time. It’s a constant distraction, though at the same time I envy that you young people have everything at the click of a button. Have you felt your writing style change with the passage of time? As a writer, I’ve always enjoyed language – the use of language is what it’s all about. When I was younger, I enjoyed that power a lot more – my descriptions tended to be fuller and richer. In my later books like The Zigzag Way I’ve probably been more spare and sinewy, and I have been trying to – not cut out adjectives but to select with the greatest possible care. It may have something to do with the fact that I now read a great deal of poetry. You’ve written children’s books, a movie screenplay (for Ismail Merchant’s film of In Custody), and numerous works of criticism. Is there any area of writing you regret not having tried? (Smiling) One does what one can with one’s life. I’ve tried to make the fullest use of what I had, and I hope I’ve succeeded to an extent. Delurking to say thank you. She is my favourite author and that was just wonderful to read. 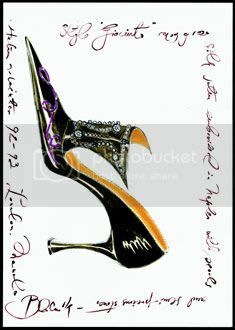 Shoe Fiend: good to see you here. I have very high regard for Desai's work too, although until a few weeks ago I had only read two of her books - read the others as preparation for this meeting. Particularly love Baumgartner's Bombay, as I mentioned in the post. Very nice interview. I am usually not a fan of interviews since there is a great possibility these days of the questions dominating the answers, but needless to say, this was anything but that. The questions were succinct yet effective. In fact, I am not at all exaggerating when I say that I felt like I was sitting right there with Ms. Desai and you. Yours and her words painted this picture of calming green trees on a slightly somber cloudy day against the backdrop of whitewashed buildings, thus setting that mood. I love the fact that she had chosen the common man as the protagonist for some of her books. Gives it a realistic undertone. Reading about Deven and Nur in In Custody reminds me of the subtle camarederie between the protagonists in Shatranj ke Khiladi. Sigh, so much to read, and so little time. Thank you very much for that. Anita was my thesis adviser when I was an undergraduate, and I often miss talking to her and hearing her frequent utterances of "you young people". :) She brings Civil Lines alive in a way no one else quite can, eh? That's a wonderful, thoughtful interview - you've made her come alive. I wanted to make one point which I think very few people make about her. That sentence for sentence, she writes with an elegance, a natural sophistication and intelligence, that of all the Indian writers, only Rushdie really possesses to my mind (although in a different way). There are sharper writers, who write with more energy and drive, or whose stories twist and turn smoother but no one I can think of where the prose has the natural gravity. That wonderful, winding opening sentence in Baumgarnter for example. So extraordinary and complex, and oddly European in its tone - a fact that Rushdie observes in his introduction to In Custody, that Anita is ofcourse half German, and that there is an Europeaness to the writing. Like you, I read Desai seriously only recently after having decided to publish her, and what a discovery she has been. Many thanks for this. Thank you for posting this, and for yesterday's interview. I needed to read those words. I am overwhelmed by the contextual conversation and comments by Anita. The passage quoted to illustrate vividity could have been better. No? I would be sorry to think that such is the best example of her prose. Of course, if you decide that you "have to" like her / someone then you will find some or the other reason to justify so. Following a trail from Sonia's via ShoeFiend's to your blog, I'm really glad to read this interview of my favorite author. Pages go by and nothing happens. I think when a seasoned writer comes across something like this, he knows he is reading a really good author. It is very difficult to make pages go by without nothing happening. I think that the loss of dependence on incident is a hallmark of only the best of writers. Thanks a lot for such an interview. It has had the effect of humanizing Desai for me whom I'd known only through her works. that was one wonderful interview with my favorite writer.It felt like i was part of it all.what about her short stories ? they are equally engaging. I am v.sunitha from chittoor, Andhra Pradesh. I am a phd scholar pursuing research on Anita Desai. The interview is very informative and especially useful to explore the autobiographical elements of the writer. Hello there, my name is Régis and I am preparing a thesis on Anita Desai in Brest University. I read your interview, which I found extremely interesting. I am also very curious to know more about your own research on the amazing writer Mrs Desai is. If ever you were interested to share information, ideas, thoughts... I am willing to talk to you about my 3 years own research. It was reaaly very nice reading the interview. I am also pusuing my Ph.D. work on Deasi. I request you to kindly respond as it will be mutual benefit. I really liked what you wrote. Being a huge fan myself cannot but feel jealous of you!